5:15am. Jack's crying. I go upstairs, silently and without eye contact change his diaper while he is still in his crib and giggling. Give him his pacifier and get the heck out of dodge. 7:00am. Ellie appears next to my bed. She wants to know what we are doing today. She wants to know if a friend can come over. I tell her she's going to school today. She would like to know what her teachers have planned for her school day. I tell her I don't know. She suggests that I check my phone. I pull her into the bed where she lays in between me and Grant and asks questions. I randomly say "yes" or "no" but I'm not really paying attention. 7:15am. Jack is awake and ready to eat. I make a bottle, walk upstairs, get the boy, come back down to the couch and feed the hungry kid. Ellie sits on my lap at the same time and lists all the shows she would like to watch and in what order. 7:20am. Make breakfast. By "make breakfast" I mean pop an Eggo waffle into the toaster and serve that with a banana and a cup of milk. Voila. Turn on PBS Kids (hooray for Curious George and Daniel Tiger!) and put Jack in his exersaucer. 7:45am. Put on some clothing and a minimal amount of makeup. 8:40am. Leave to take Ellie to school. 9:05am. Return home. Put Jack in his crib to finish the morning nap he started in the car. Get to desk, start working on Stella & Dot. Set up shows, email back responses to customer questions, make lists and order more samples. 9:30am. Finally surrender to the fact that Jack isn't sleeping anymore, but playing and bouncing in his crib. Go upstairs and get him and put him in a bouncy seat in my office. WORK for two full hours. Pay bills. 10:00am. Feed Jack a bottle. Talk on the phone during that process. 10:30am. Play with Jack because he's so dang cute. 11:00am. Prepare packages for post office run that needs to happen at some point today. 1:30pm. Sit in car while Jack sleeps and text with other sweet Stella stylists - answer questions. Ask questions. Post in some of my Facebook trunk shows. 2:00pm. Get a Diet Coke from Wendy's for the love. 2:20pm. Pick up Ellie from school. She gets in the car with a giant book that encompasses her entire school year. The book has artwork from the whole year as well as self-portraits and photographs of her and her friends with all the activities they did all year. This is actually a family portrait. That's Jack at the top. Then me, Ellie (see her curly hair?) and Grant on the right. 2:23pm. 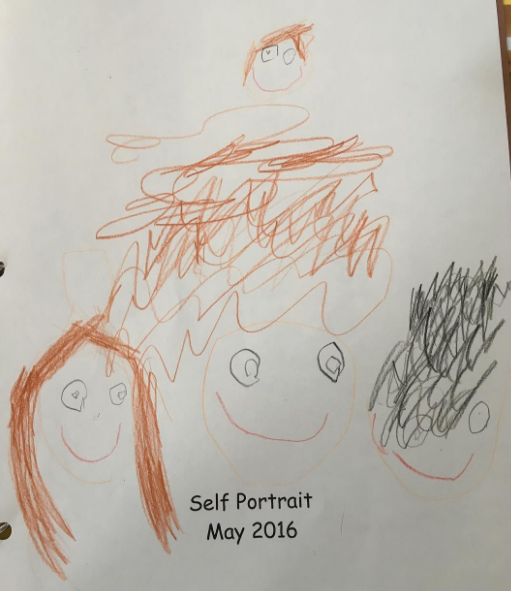 See Ellie's end of the year progress report. 2:24pm. See that Ellie's sweet teachers wrote "Ellie is every teacher's dream. She's enthusiastic, flexible, and always cheerful. It's been a joy to have her in our class." 2:25pm. Weep like a baby. 3:00pm. Get home and play with Ellie and Jack and cry because they're getting so big. Give Ellie a snack. Turn on Nick Jr. and breathe for a few minutes. 3:45pm. Feed Jack a bottle. 4:45pm. Leave for the dance studio to buy more tickets for Ellie's recital. Get there and realize the line is approximately forever long. Stand there holding the giant 6 month old baby and wrangling the needy, hungry, tired little girl who doesn't understand appropriate line waiting behavior. Needing to go potty right before it's your turn is not okay. Stand there for an hour, buy tickets, leave - dripping with sweat because that was a whole lotta work. Arm workout accomplished. 6:00pm. Get home from dance studio. Realize that the baby is asleep and you're leaving for dinner with your Bible study group in 20 minutes. Sit in the car with the kids so Jack can sleep. Let Ellie climb around like a hooligan. 6:15pm. Grant sits in the car with the kids so you can go inside and freshen up and get some food to bring to the restaurant for Jack. 6:30pm. Get to Smashburger cause kids eat free on Tuesdays. Visit with our Bible study friends. Jack eats pears and gets sleepy. Ellie has crossed over from sleepiness to delirious hyperactivity. She sits with a friend of ours who lets her watch hype videos of the new water park. Ellie loses her mind with anxious anticipation. 7:50pm. Get home. Change Jack's clothes and feed him a bottle and put that boy in the bed. Daddy takes care of Ellie's bed time. 8:30pm. Come downstairs and write this never ending blog. 8:52pm. Shut it down and sit on the couch and watch television and that's the end of that.